Heidelberg, January 30, 2019 - Periodontal instruments require regular manual or mechanical regrinding. This shortens their shelf life because they lose not only substance but also their original shape. Studies have shown that sharpening rarely maintains the factory-set angles, often reduces the functionality of the instruments or even makes them completely useless. The ineffective, time-consuming and injurious procedure becomes superfluous with American Eagle's XP® technology. 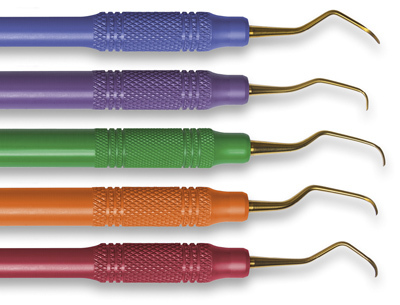 A special alloy makes the working ends of scalers and curettes extremely hard and resistant, so they retain their high quality cutting edges and are always ready for use. Sharpening stones are history, time can be used more productively, and the practioner no longer tires prematurely from the strenuous use of blunted blades. American Eagle is a Young Innovations brand, a leading developer, manufacturer and distributor of high-quality dental products. The portfolio includes innovative solutions for prophylaxis, diagnostics, restoration, periodontology, implantology, endodontics and orthodontics and world-renowned brands like Young™, Zooby®, Microbrush® and American Eagle Instruments®. The American corporation has its headquarters in Chicago and its European centre in Heidelberg, Germany. The enterprise was founded in 1900 and is owned by The Jordan Company.